There will probably be fewer writing updates here for a while because I took a job. Actually, I will be working two jobs that aren't writing. I'm going to be working three mornings a week helping with a dear elderly woman, and the other will be a few hours each week helping with sorting and shelving the incoming books at a thrift store. While I'm excited about these new opportunities that God is bringing my way, it is hard to see all that writing time dissolving. While there are some hard things about how life is changing, I'm so excited right now. I see God healing the wounds from 2017 in some powerful ways. One of my prayers right now (as I mentioned in Sunday's blog post) is that I would live with my hands open. If I have learned one thing it is that I need not cling to things or people to tightly as if they were mine. I also shouldn't hold my fists closed because I don't want my life to change. I'm striving toward the goal of living with my hands open both for giving and receiving. 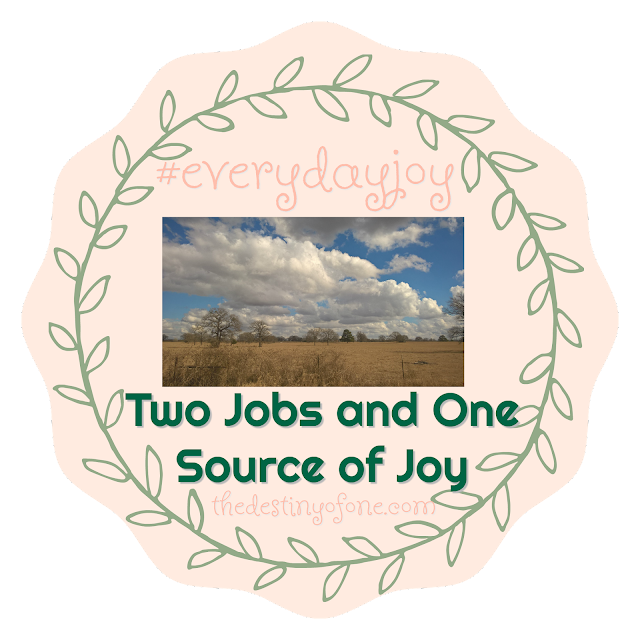 I talked late last year about everyday joy. Today, I'm thinking about it again. I was blown away by God's goodness, but juggling all the pieces of my schedule has stressed me. Yet, I had to remind myself what a blessing all these jobs are. I'm getting two jobs that have flexibility and will still allow me the time to work on my writing. The money I'm making will help pay for my upcoming trip to Colorado, my normal bills, and the editing and cover designs for my summer releases. Isn't that something to be joyful about? In the midst of the changes, I will choose to look to God as my source of joy. Congratulations on your two jobs. God Bless you.